Risks are events that can cause serious damage to a business. It is very important to account for these risks and find solutions that work. 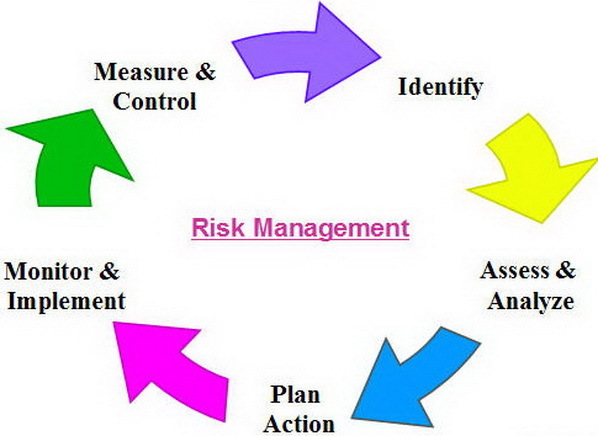 There is a simple risk management process following which you can easily take care of the risks. Explained below is the process with risk management principles that must be followed. The first step is to recognize possible risks. Reasonably, every business faces risks; however, the kind of risks faced varies from business to business, which is why it is vital to take steps to unmistakably identify risks. The identification process begins by identifying the source of the risk. Without finding the source, it is not possible to properly assess the risk and take actions necessary to remove or minimize it. Once identified, it is important to assess risks. This process includes preparing a risk chart that mentions all the risks the business faces with their probability of happening and the dangers they cause to the business, if triggered. Assessing is a difficult process that is done keeping the business in mind. It is very important to assess every risk properly so that a strategy can be planned. Once the risk charter is prepared, it is time to develop a plan to take care of all the risks mentioned. However, since a business faces numerous risks, it is not viable for it to work on all the risks at the same time. It should first plan for risks that have the highest probability of happening and can cause the maximum damage. Once these risks are taken care of, one can move on to other risks. It should also be remembered that the danger a risk possesses may change with time, which is why it is important to keep all these points in mind when developing a plan. Once a plan is prepared, it is time to implement it. However, one should be very careful in implementing the plan making sure that everything is handled well. It should also be remembered that the implementation itself may take a good amount of time depending on the nature of the risk. Once the plan has been implemented, it is time to reassess the results. It is very important to oversee everything to know if the risk has actually been taken care of or it still exists. Additionally, some new risks might have cropped up to look after now.